As Royal Portrush prepares to host the world’s top players in July for golf’s oldest tournament, the scene is set for Northern Ireland to truly make its mark on the international golf scene. The 148th Open takes place on the celebrated Dunluce Links at Royal Portrush Golf Club from 14-21 July, only the second time the Claret Jug has been contested outside Scotland or England. The Harry Colt masterpiece was also the venue for The Open in 1951, when Englishman Max Faulkner won a princely £300 out of total prize money of £1,700 for his victory. This year’s winner will pocket almost $2 million. Such has been the level of interest that tickets for the four championship days sold out months ago, although tickets are still available for hospitality and the four practice days and through golf tour operator packages. In addition to the 200,000 spectators likely to attend competition and practice days, many of whom will be from overseas, The Open is expected to be watched by a global TV audience of 600 million in 150 countries. It will be the biggest sporting event ever held in Northern Ireland and a showcase for the country’s golf product and other attractions. A huge spectator village with vending and refreshment outlets is being constructed for The Open on what was formerly the closing two holes of Dunluce Links. They have been replaced by newly-created 7th and 8th holes “borrowed” from the sister Valley Course as part of acclaimed enhancements ahead of this year’s final Major. Royal Portrush lies in the heart of the small Causeway Coast seaside town of Portrush, which has a resident population of just 7,000. Events will take place throughout the entire week in the town to entertain the throng of the Championship attendees. A park-and-ride service will ferry the public to and from nearby car parks to keep traffic out of the town. Visitors can slake their thirst and try local dishes at several restaurants, cafes and pubs in Portrush and the surrounding area. They can also find traditional music at many establishments, among them the Crosskeys Inn, Ireland’s oldest thatched pub 50 minutes away near Lough Neagh. There are many other attractions awaiting visitors in and around Portrush. Those driving from gateway city Belfast can take the spectacular, 120-mile (193km) Causeway Coastal Route that skirts the Atlantic coast to Derry-Londonderry, its historic centre encircled by 17th century city walls. Highlights along the way include: the myth-shrouded Glens of Antrim, with its 17th century Glenarm Castle and The Gobbins bridge suspended above the sea and below soaring cliffs; Rathlin Island, reached by ferry; beautiful sandy bays with beaches such as Whiterocks Beach and Portstewart Strand; the cliff-top Mussenden Temple folly; the Old Bushmills Distillery, the island of Ireland’s oldest working distillery that has been producing whiskey since 1608; and, just inland, the Dark Hedges – one of many Game of Thrones film locations in Northern Ireland and which features as the Kingsroad in the hit TV series. The undoubted star of the craggy Atlantic coastline is the Giant’s Causeway, Northern Ireland’s only UNESCO World Heritage Site and less than 10 miles from Portrush. Created in local lore by mighty giant Finn McCool, the 40,000 hexagonal basalt columns were actually formed by volcanic activity 60 million years ago. The National Trust-managed site has a cliff-top visitor centre with interactive exhibits explaining its origins and stories. Visitors can then either walk or take a shuttle bus down to the world-famous rock formations on the shoreline, using an audio guide available in 11 languages. Just a 10-minute drive further on is the Carrick-a-Rede Rope Bridge, suspended almost 100 feet above the sea and originally built by salmon fishermen to access Carrick-a-Rede Island. It is also managed by the National Trust and has timed tickets during busy periods, valid only on the day of purchase. Close to Portrush and visible from several holes of Royal Portrush are the brooding remains of Dunluce Castle, built on dramatic coastal cliffs more than 500 years ago. For visitors attending The Open who want to stay on and play golf, there are excellent courses within an easy drive of Royal Portrush. 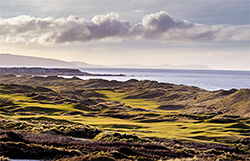 Just 15 minutes west lies Portstewart Golf Club, offering 54 holes of links golf set amidst dunes and a towering opening tee shot on its championship Strand Course, host of the 2017 Dubai Duty Free Irish Open. Many regard the opening hole, one of 11 created by two-time Open Champion Willie Park Jr in 1894, as the finest in the whole of Ireland. Across the River Bann from Portstewart is Castlerock Golf Club, its Mussenden Links first laid out by Scottish pro Ben Sayers, who is more famous as a golf club maker, and later reworked by Harry Colt. Golfers wanting to combine playing rounds during a resort stay with watching The Open can choose from Roe Park Resort, half an hour from both Portrush and Derry~Londonderry, Lough Erne Resort with its Nick Faldo-designed championship course on the southern shore of Lough Erne, Northern Ireland Open host venue Galgorm Castle Golf Club and nearby Galgorm Spa & Golf Resort 30 miles south-east of Portrush, or the Hilton Templepatrick Golf & Country Club 20 minutes from Belfast. Northern Ireland’s capital is only 75 minutes by road from Portrush and is a good option to use as a base for visitors going to The Open. It has several top-notch golf courses close to the city centre, among them Ireland’s oldest golf club, Royal Belfast Golf Club, that was founded in 1881 as well as Belvoir Park Golf Club, Malone Golf Club, Shandon Park, Knock Golf Club, Dunmurry Golf Club and Holywood Golf Club, where local hero, four-time Major champion and 2019 Players Championship winner Rory McIlroy honed his skills as a youngster and where a special memorabilia-filled area of the clubhouse celebrates his career. An hour south of Belfast lies Northern Ireland’s other trophy golf venue that visiting golfers will undoubtedly want to include, Royal County Down Golf Club. Its iconic Championship Links is the work of three golfing legends – Old Tom Morris, Harry Colt, and Harry Vardon – as well as Donald Steel, who later modified some holes. Just along the coast is another seaside links gem worth including in a stay, Ardglass Golf Club, boasting the world’s oldest clubhouse built as a castle over 600 years ago. No matter who lifts the Claret Jug this year, visitors who come for The Open will be onto a winner.